Working in 2D and 3D, our motion graphics team creates everything from online advertising to internal plasmas and large-scale media wall presentations. 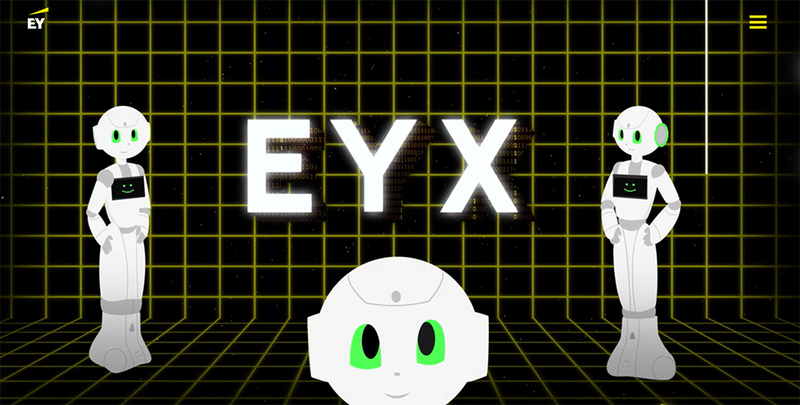 Using Pepper the robot as inspiration, EYX commissioned CSG to create an animation that sits on the home page for their latest Sharepoint site. This dynamic animation using 3D, film and visual effects was created to introduce EY’s new integrated financial platform, Mercury. CSG created this promotional video for a new flagship Tax tool, we visualised demo screen grabs in a dynamic and engaging way using 3d decks, motion graphics and video elements. This animated film on the subject of money laundering was embedded into EY’s Learning tools. All characters were drawn in Illustrator, run through After Effects and animated using the Duik rigging tool and Cinema 4D. Our client created a SharePoint site which uses an interactive game to help EY employees learn the rules of ‘hospitality, gifts and favours’. We were asked to create a plasma show for the campaign to raise maximum awareness of the site. We were engaged to create animations for an existing script – for a proposal about internally restructuring BMC globally.